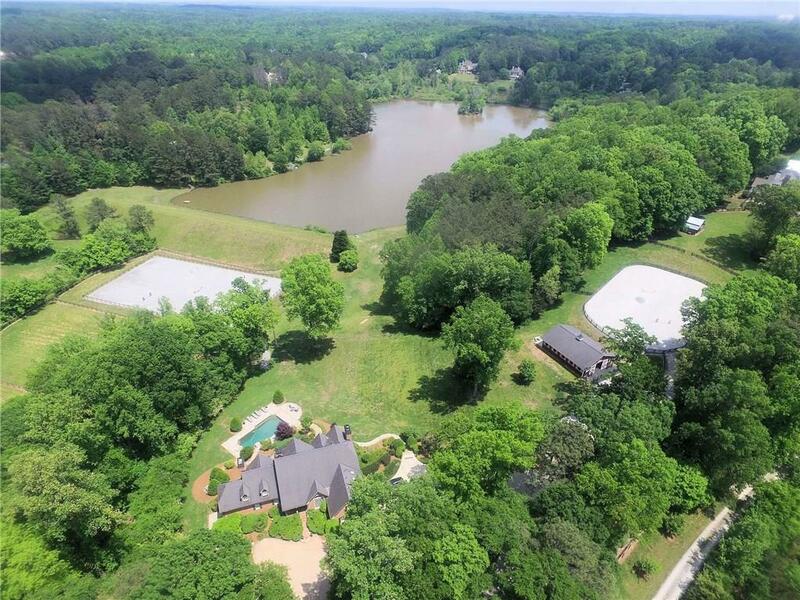 Three Sisters Stables equestrian estate is the perfect property for the horse owner/trainer or for the owner that wants 18.2 +/- acres of some of the most beautiful land in Milton. The rear of the home is a wall of windows with breathtaking views from all rooms on the main floor and terrace levels overlooking the lake, lush rear of the property and the riding arenas. The home has been completely updated. Finished terrace level with in law suite. Gated entry to the estate. Six stall stable, upper and lower riding rings. Inground heated pool and deck overlooking lake. Directions: 400n To Exit 10 (Old Milton Pkwy). (L) On Old Milton Past Main St. (Hwy 9). 1st (R) On Roswell St. Changes Name To Canton St Then Changes Name To Hopewell Rd. Distance Is 4.3 Miles From Old Milton Pkwy. 14225 Hopewell Rd Gate Entrance Is On The (R).